Having an APU single-board-computer is pretty pointless without also having an operating system installed. But getting an operating system on an APU server can be a bit trickier than you might think. Thankfully, we’ve found a really easy way to install an operating system onto an APU that doesn’t involve tearing your hair out. 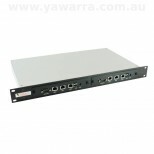 And it works for anything you want to install, whether that’s Voyage Linux, monowall, pfSense® or something else. I think you’ll agree that having an APU single-board computer isn’t much use unless you’ve also got an operating system installed. But getting an operating system onto an APU server is actually trickier than you might expect. 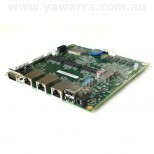 Hi, I’m Nikki, from Yawarra Tiny Computers and today I want to share with you the easiest way that we’ve found to get an operating system onto an APU. So the APU takes three kinds of storage devices, SD cards, mSATA drives and SATA drives. And there are four different methods that we’ve found for getting an operating system onto an APU. Firstly, that you have a card reader. Secondly, that you pull your box apart to get the storage medium out. Thirdly, that you’re not trying to use an mSATA drive because that won’t fit in a card reader. And fourthly, that you’re not trying to install Voyage Linux ’cause it needs to be running under Linux to install. The second approach involves using another Linux machine. Basically you mount your storage medium as a secondary drive on your Linux machine and install your operating system that way. But of course that’s not much use if all you’ve got is Windows machines or Macs. And equally if your Linux machine doesn’t have an mSATA drive and you want to install onto the mSATA drive it’s not much use either. The third method for getting an operating system onto an APU involves PXE booting. But if you know how to use PXE booting then what the heck are you doing even watching this video?. So you want to install an operating system onto your APU but you don’t have a second Linux machine, you don’t have a card reader, you don’t want to pull your box apart, you’re using an mSATA drive or you’re trying to install Voyage Linux. Well that’s where the fourth method comes in and we think it’s the easiest of the lot. So the fourth method involves creating a bootable USB stick. And for that you need four things: your APU board, a blank USB stick, a working computer of some kind whether that’s Windows, Linux or Mac, and you need an image of Voyage Linux that you install on the USB stick. 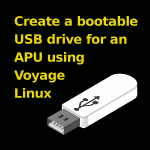 Basically you install Voyage Linux onto the USB stick and make it bootable, and then you plug it into your APU and use it to install your operating system of choice. So this last method is the easiest by far that we’ve found for getting an operating system onto an APU. And as luck would have it we’ve created a step-by-step tutorial just for you, to take you through the process of making your very own bootable USB stick. And we’ve even thrown in an image of Voyage Linux that you can download and install onto your USB drive. I’ll put a link in the description of this video to that tutorial. And if you know of any other ways to get an operating system onto an APU or an easier way, let us know in the comments. Got any questions about installing an operating system onto your APU server? Let us know in the comments below.